Be the first to share your favorite memory, photo or story of Mildred "Millie" . This memorial page is dedicated for family, friends and future generations to celebrate the life of their loved one. 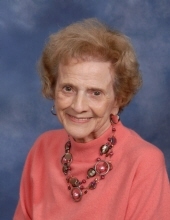 Mildred “Millie” Edwards, age 92, of Stone Mountain, Georgia, passed away on April 8, 2019. She is pre-deceased by her husband of 62 years, Clyde Edwards, and survived by her children Larry Edwards, Sherry Hancock (John, spouse), and Jeff Edwards (Jeanne, spouse); by her grandchildren Courtney Hancock, John C. Hancock, Laurie Simon (Tristan, spouse), Joseph Hancock, Kyle Edwards (Katy, spouse) and Derek Edwards (Rachel, spouse); and by her great grandchildren Cassidy Simon, Carly Simon, Makenna Simon, and Jaycie Simon. A visitation will be held on Thursday, April 11, 2019, from 6:00 – 8:00pm at A.S. Turner & Sons Funeral Home (2773 N. Decatur Rd, Decatur, GA 30033). Funeral Services will be held Friday, April 12, 2019, at 11:00am at Oak Grove United Methodist Church (1722 Oak Grove Rd, Decatur, Georgia 30033), with a reception in the Grand Hall prior to the service beginning at 10am. Burial will follow the funeral service at Floral Hill Memory Gardens. In lieu of flowers, a donation may be made to Oak Grove United Methodist Church’s Good Samaritan / Benevolence Fund or Music Ministry. To send flowers or a remembrance gift to the family of Mildred "Millie" M. Edwards, please visit our Tribute Store. "Email Address" would like to share the life celebration of Mildred "Millie" M. Edwards. Click on the "link" to go to share a favorite memory or leave a condolence message for the family.